We’re back, with another Big Finish Doctor Who audio drama review! After an extended delay, today we’re returning to the Eighth Doctor Adventures range with the first entry of Series 3, Orbis. Released in March 2009, this story was written by Alan Barnes and Nicholas Briggs, and features Paul McGann, Sheridan Smith, and Katarina Olsson. Let’s get started! Part One: Picking up where we last saw her, Lucie Miller sits at home, six months after the death of the Doctor and the fabled Time Lord Morbius. She answers the door to find the Headhunter, who promptly shoots her with a strange gun. Lucie awakens to find herself unharmed, inside the TARDIS, with the Headhunter at the controls. The Headhunter explains that the gun fires quantum-tipped time bullets, which can be “un-shot” as well as fired at various speeds; therefore she “un-shot” Lucie. She pilots the TARDIS (a bit roughly, admittedly) to what she calls “tweenspace”—a place where the dregs of the cosmos settle—where the Doctor is allegedly alive, having been transported away mid-fall by the Sisterhood of Karn. She insists the universe is being destroyed, and only the Doctor can save it. The Doctor, meanwhile, is on the tweenspace world of Orbis. He whiles away his time on repairing a small spaceship, accompanied by the planet’s jellyfish-like inhabitants, the Keltans. He is approached by a Keltan named Selta, who warns him of a storm, but inadvertantly causes him to break the ship engine’s drive belt. He muses that a good pair of tights would fix it—but there are no bipeds on this planet, and Earth is a long way away. He diverts his attention to the storm—he has lived here much longer than any other inhabitant, and he knows something is wrong; the storm season should have long since ended. Out in space, ships approach. They carry representatives of the Molluscari race, with whom the Keltans previously fought a minor war; the war was ended by the Doctor, who petitioned the Galactic Council for intervention. Molluscari Secretary Saccostrea meets with her leader, Crassostrea. The rather rotund Crassostrea is in the process of transforming from male to female in preparation for spawning. Saccostrea reports that Orbis has been scanned, and is confirmed to be experiencing atmospheric changes; this will be terrible for the Keltans, but fortuitous for the Molluscari. Crassostrea reports the findings to the Galactic Council in a bid to claim the planet. Meanwhile, aboard the TARDIS, the Headhunter tells Lucie that she acquired the ship from the Sisterhood, who had held it as a trophy of sorts. With some difficulty, she sends it heading for Orbis. On Orbis, the Doctor helps rescue a young Keltan from a well. In the process he evaluates the recent storm damage, and decides to help the Keltans put their homes on stilts for safety from floods. The town’s leader, Yanos, thanks him, but admits that he worries for the planet in the face of its continuing changes. The Doctor encourages him, reminding him of how they overcame the Molluscari. Unfortunately, he is unaware that even now, the Council has decided that the Keltans’ claim to Orbis has become untenable—and they have granted the Molluscari permission to claim the planet. In the TARDIS, the Headhunter explains that the TARDIS, without the Doctor, is dying, and expelling temporal waste, which is in turn the source of the danger to the universe. However, she doesn’t really want to save the Doctor—she wants him to regenerate the ship and then transfer it to her. She aims to use Lucie to compel him; she reveals that there is still a time bullet in Lucie’s brain, which will kill her unless the Doctor cooperates. Meanwhile the Doctor muses on the moon of Orbis; it neither rises nor sets, but is fixed over a point fifty miles out at sea. He and Selta are interrupted, however, by the arrival of the Molluscari ships. They rouse the village to alarm. Aboard ship, Crassostrea wants to blast the Keltans, but Saccostrea intervenes; their rights to the planet are not yet active, and they are here to warn the Keltans of the plan. Crassostrea addresses them, and debates with Yanos and the Doctor, and provides a data pearl containing the Council’s declaration, which states that the ecological changes have mooted the Keltans’ claim to the world. Crassostrea cuts off one of Yanos’s tentacles in the process of relinquishing the pearl; in response, the Doctor uses his sonic screwdriver to begin vibrating the Molluscari out of their shells, inflicting pain on them. The invaders retreat, and their ships take off. The Doctor and Yanos begin plans for defense. The TARDIS lands on the planet, and the Headhunter sends Lucie out…directly into the ocean. With a high salt content, it will buoy her up—but she’ll have plenty of time to think as she floats the fifty miles to the Doctor’s beach. The Headhunter then contacts an unknown recipient and transmits a set of coordinates, making plans for an ocean dive at dawn. Lucie awakens to find Selta standing over her, and is frightened; she has a bad history with jellyfish. However, they patch up their differences—until Lucie mentions her soaked tights. When Selta hears that word, she recognizes it as the thing the Doctor previously mentioned, and she rips the tights off of Lucie and runs off. Lucie chases her back to the small spaceship, where she finds the Doctor—but he ignores her and takes the tights to repair the ship. He doesn’t seem to remember her at all; and Lucie realizes that he has lost his memory. Part Two: Lucie is angry when she discovers that the Doctor can’t remember her, and she slaps him before storming off, leaving him to his work with Selta. However, he suddenly recalls that Orbis never had a moon before; he can remember it suddenly appearing a few decades ago. In the meantime, he uses Lucie’s tights to repair the spaceship’s engine and power it up. He laughs at Selta’s suggestion that he plans to return to Earth—a planet to which he no longer feels any attachment—but then tells her that the approaching moon is causing the increase in storms. He plans to contact the galactic council about this situation; but he really wants to visit the moon. Selta suggests asking Lucie about his TARDIS; and he realizes that the only reason Selta and Lucie can understand each other is because the TARDIS is translating—meaning Lucie’s story is true! He runs off to find her. Elsewhere, the TARDIS lands aboard a Molluscari ship, and the Headhunter meets with Saccostrea. She forces Saccostrea to bring Crassostrea to her, instead of the other way around. They oversee the aforementioned dive, which is at first unsuccessful, costing the lives of the divers; the Headhunter insists on sending down more. Eventually they successfully retrieve the small object that she is searching for. The Doctor finds Lucie, who tells him that the Headhunter—whom he only vaguely recalls—has the TARDIS. He makes her slap him again, and tells him that her fingers are charged with chronon particles from the TARDIS, which are slowly reviving his memory. She refuses, until he angers her by insisting that he is a different man now, and will not leave Orbis after saving it. Selta arrives at that time, and says that Yanos has received a message from the council. The Doctor unsuccessfully argues with the council for intervention, but they are not willing to act until a cooling-off period has passed. They are interrupted by the return of the Molluscari, who announce that they are claiming the planet. However, Crassostrea announces that, in a gesture of solidarity, she will transport select Keltans to an artificial habitat elsewhere in the galaxy. She asks for volunteers to come to the beach. While the Doctor is trying to think of a solution, the Headhunter arrives and mocks him for his futility. She advises Yanos to take the Molluscari offer. Selta reveals that she is in league with the Headhunter, and also advises taking the offer; Lucie tries to intervene, and is forced to bite Selta to get free. The Doctor gives his screwdriver to Selta for protection and tells her to keep the Molluscari busy. Lucie tries to attack the Headhunter, but the woman shoots her with her time-bullet weapon. Saccostrea—aboard ship—tells Crassostrea that the Keltans are gathering; Crassostrea orders more ships in to begin “processing” them. Lucie is not dead; the bullet is moving into her chest at a rate of one millimeter every thirty seconds. The Headhunter offers to save her, and even return the TARDIS, if the Doctor will do something for her. She produces the device found in the sea, and breaks off the encrusting coral, revealing the control device for Morbius’s stellar manipulator; the Doctor was holding the activator when he fell into the abyss centuries earlier. She says it will only respond to a Time Lord; as all the others are in hiding, that only leaves him. She orders him to turn it off. He refuses, believing that Lucie is working with the Headhunter and that they have planned this together, and he leaves to help the Keltans. Lucie intercepts the Doctor, but she cannot convince him of her innocence. He only relents when she tells him the TARDIS is also dying. The Headhunter joins them and directs them to the massacre—no, the feast—about to happen on the beach. Crassostrea tells Yanos that the Molluscari will use the waters of Orbis to spawn, but before they can do so, they must feast. Selta threatens her with the screwdriver in an attempt to rescue Yanos; forced to use it, she focuses on Saccostrea, who quickly dies. As she turns it on Crassostrea, the Doctor steps up and takes it from her, quietly condemning her actions—it’s a tool, not a weapon. Crassostrea, meanwhile, shrugs it off; she planned on eating Saccostrea anyway. The Doctor reveals that he already knew the truth about Selta’s bargain with the Molluscari—the readings from the data pearl could only have been taken from the surface, and in fact they precisely match the atmospheric scanner he and Selta had used. She says that the catastrophe facing them was beyond even the Doctor, and she had only sought to save as many of her kin as possible—in fact, she herself has decided to stay behind and die with the Doctor. He rejects the offer—he only wanted a friend, not a martyr. He tries to order the Molluscari off the planet, but fails. The Headhunter again mocks him for his efforts. She has the TARDIS brought out from the Molluscari ship and tells the Doctor he must leave the Keltans to die. He refuses; Lucie joins him, but is stunned to discover that the Molluscari plan to eat the Keltans. Crassostrea wants to kill the Doctor and Lucie, but the Headhunter stops her; he has not yet turned off the stellar manipulator. Lucie makes a speech, pleading for the Keltans’ lives; the Doctor finally seems to remember her. He takes out the activator and asks the Headhunter to un-shoot Lucie; she does so. However, the Doctor refuses to turn the activator off, and increases its power. A clap of thunder is heard, and the sky goes white. The Keltans erupt into a panicked frenzy. The moon begins accelerating toward Orbis. The Headhunter berates the Doctor; the moon is the stellar manipulator! Now, through his stupidity, it will indeed destroy Orbis. He tries to deactivate it, but the controls are jammed. The oceans begin to boil, and the temperature rises; the Doctor orders Crassostrea to evacuate, but she can’t—the rising temperatures are causing her to spawn early. At the same time, the temperatures drive the other Molluscari into a feeding frenzy, and they begin to slaughter the Keltans. The Headhunter congratulates him on his failure, and urges him into the TARDIS, but he refuses to leave the Keltans. He throws the activator into the sea to be destroyed with the planet. Suddenly horrified, the Headhunter prepares to leave in the TARDIS; the Doctor, meanwhile, declares he is no longer a time traveller, and is prepared to die here. Lucie grabs the time-bullet gun and shoots him. Inside the TARDIS, and once safely away, the Headhunter un-shoots the Doctor, who recovers at once. He angrily denounces Lucie for saving him against his wishes, but she insists it wasn’t just for her; it was for the universe, as the TARDIS is still causing destruction. The Headhunter laughs and says that she made that part up to motivate Lucie. When Lucie tries to attack her, she threatens Lucie with the gun. The Doctor discovers that Orbis is gone; the Headhunter explains that the manipulator consumed the planet, and having also consumed its activator, it destroyed itself. She tells him that while he’s been away, she and others have had to save the universe in his absence; it really can’t do without him. Now, with him back, she can leave. She tells him he has to sort out his issues himself, and then she teleports back to her warp ship. The Doctor is awash in guilt, and Lucie also apologizes for tricking him. Lucie gently reminds him that Earth and other planets still need saving; with nowhere else to go, he sets course for Earth. It’s a grim story, with no sign of a happy ending anywhere. Many Doctor Who stories can be viewed/read/listened to as standalone items; this is not one of them. It relies heavily on the events of last season’s cliffhanger; and its dismal ending just begs for redemption later in the season. It remains to be seen whether we’ll get it. Now, an unhappy ending is not altogether unheard of in Doctor Who. What sets this story apart—and I’m not calling it unique, but it is certainly rare—is that the Doctor utterly fails. It’s quite common for the body count to be high even when the Doctor wins; but win, he usually does. Here, he loses, thoroughly and handily; the fact that he takes most of his opponents with him in his failure doesn’t make up for that. He’s left wracked with guilt at the end, but reluctantly resumes his traveling life—older, perhaps wiser, but certainly more weary. Guilt is a fairly common theme for the Eighth Doctor. He is a man of many regrets—just look at his last moments, in The Night of the Doctor, where his penultimate words are an apology. It’s perhaps appropriate, then, that this story also includes another frequent Eighth Doctor theme: Amnesia. When he meets Lucie Miller in this story, he has long forgotten her, although he seems to remember events prior to his time with her. He regains his memory in the same story, but it’s not stated how much he remembers, and I wouldn’t be surprised to see this continue to be a factor. Personally, I think these two themes are a bit poetic; on the one hand, the Doctor has much for which to feel guilty, but on the other hand, he mercifully forgets a lot of it (over the course of his life, that is—not in the particulars of this story). This story takes steps to codify a longstanding theory: The theory that the Doctor can’t remember how old he is. In speaking about his age—the Keltans call him “Old Doctor”, which he resents—he admits that he can’t remember it, and usually rounds a bit for the sake of local time anyway. Perhaps this is spelled out in other stories, but this is the first time I’ve seen it; and I, for one, am glad to see it acknowledged. Given that this happens, here, in the Eighth Doctor’s life, it makes the outlandish figures cited by the NuWho Doctors a little easier to understand. I was a little less thrilled to see six centuries randomly inserted into his lifespan—it’s the Siege of Trenzalore before it was cool. It is what it is, but I don’t have to like it. I knew it was coming, after the cliffhanger last season; but I was happy to see Katarina Olsson’s Headhunter return. She’s proven to be an interesting character: a bit like the Master (or Missy, more to the point), but without the delusions of grandeur. She’s happy to be both a schemer and an accomplice; she likes to be in the thick of things, but doesn’t want to be the primary villain (well, of course she doesn’t think of herself as a villain, but you know what I mean). We find her with yet more plots in the works at the end of this story; I won’t spoil it, but then, it would be hard to spoil, as it’s couched in the usual evasive terminology. I found her weapon of the day, a gun using “quantum-tipped time bullets”, to be silly; it’s a ridiculous bit of technobabble even for a show that plays with time-travel like Play-Dough. There could easily have been better ways to threaten Lucie’s life; I hope that device will be abandoned from this point. While the Doctor has changed, Lucie hasn’t, and that’s a good thing. I’ve often found myself comparing her to Clara Oswald. In many ways the two companions are similar—both from Blackpool, similar ages, similar personalities and speech patterns (in fact, they’re close enough in age and time period that it’s not unreasonable that they may have met). However, if the Headhunter is Missy without the delusions of grandeur, then Lucie is Clara without delusions of grandeur; and for that I like her more. If the fans who have long wished for an Eighth Doctor series ever got their wish, I’d love for her to make an appearance. In this story, she is—to borrow an old pun—just what the Doctor ordered; it’s Lucie who brings him back to himself, though it’s a painful experience for him. It’s further evidence that the Eighth Doctor Adventures are really Lucie’s story as much as the Doctor’s—another way in which she’s similar to Clara, though I think the balance was tipped even more heavily toward Clara. Continuity references are mostly to earlier EDAs. Lucie mentions the service station from Horror of Glam Rock, and the Dalek invasion from Blood of the Daleks. Morbius (The Vengeance of Morbius) is mentioned, but not seen; however, he’s not conclusively seen to be dead, either, leaving it open for him to return. The Doctor also makes general references to other companions and trips to Earth, but generally without specifics, though he does mention “Axons”, “Autons”, and other multiple-appearance villains. Overall: This is certainly a downer of a season opener. It’s still a good story; but don’t come here looking for laughs or rainbows. I’m interested to see where it goes from here. Still, it’s good to have Lucie and the Doctor back; as it’s been a year since I last posted in this series, it actually feels like a significant gap for me as well as for the characters. I expect good things to come. Next time: I’m still considering myself to be on hiatus from this review series, so I can’t guarantee it will be in the next few weeks; but when we return, we’ll continue with the Eighth Doctor and Lucie in Hothouse, the second entry in Series Three of the EDAs! See you there. We’re back, with another Big Finish Doctor Who audio drama review! 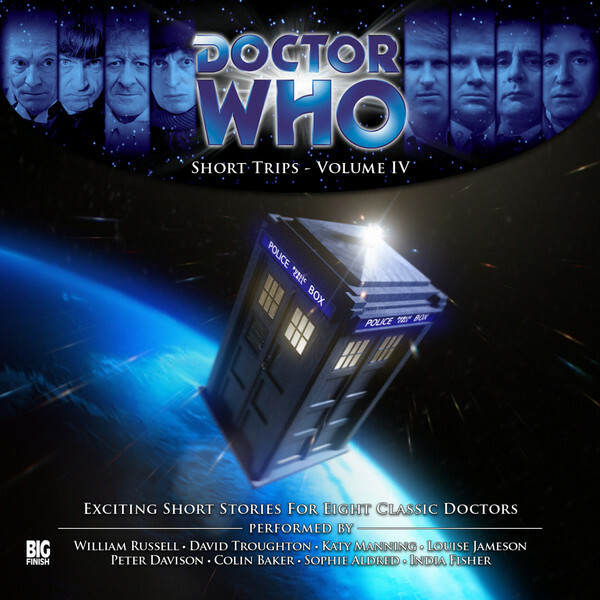 Today, we’re examining the Eighth Doctor’s contribution to the Short Trips, Volume 3 collection, All the Fun of the Fair. Written by Bev Conway, this story features the Eighth Doctor and Lucie Miller, and is read (oddly enough) by India Fisher. Let’s get started! A carnival barker calls fairgoers into a futuristic ride: a strange box marked “Police Public Call Box”. Pay your coins, step inside—and arrive in the future! Next morning, Smith is thinking over ways to make more money on the box; but his mind drifts over to why he claimed it goes to the future in the first place. It was that strange couple who first mentioned it—the young lady, and the odd man she called “the Doctor”. Perhaps he was a doctor, too, though it seemed unlikely. At any rate, that doctor fellow disappeared into the box and didn’t come out; the girl was outside yelling at him about not getting the controls right. Smith is broken out of his reverie by a young gentleman who calls him by name. Smith offers the boy a ride in the “magic box”, but the boy declines. He calls himself Detective Miller, and tells Smith that he is following up on the testimony of Constable Jones, regarding a number of missing persons. He cites testimony from several of the neighboring shopkeepers; Smith concludes that this is a dangerous situation indeed, and redoubles his attempts to get Miller into the box. Miller agrees to open the door of the box; but as soon as he does so, he slaps a handcuff on Smith, and tells him that they will investigate the box together. Miller then calls for someone named Lucie—the girl who had been with the Doctor! She insists on going in as well, calling the box the TARDIS. Inside, they close the door, and the wheezing sound is heard; and when Lucie opens the door, they are in the future. All of Smith’s victims are gathered outside, along with the Doctor; and none of them are happy to see Smith. They berate him, until the Doctor intervenes. Detective Freddie Miller, Lucie reveals, is one of her own distant ancestors, recruited by her to help. He helps them get the missing persons back into the TARDIS. The Doctor tells Smith that Detective Miller will be taking charge of Smith to prevent any further troubles, and then takes them all back to the fair. It seems everyone gets to go home…except the Doctor and Lucie. Later, Smith reflects that this was the beginning of a friendship between himself and Miller, with Smith eventually becoming godfather to Miller’s child. I have yet to find an Eighth Doctor/Lucie Miller story that I dislike; but I have to admit that this one is an oddity. First, there’s the narration. India Fisher does a great job narrating, as usual; but this story features Lucie Miller, not Charley Pollard, and it’s very odd to hear Charley’s customary actress dictating Lucie’s lines. I realize that Sheridan Smith, who customarily plays Lucie, may not have been available for this recording; but it seems it would have been a simple matter to alter the story to feature Charley rather than Lucie. The only change of any substance would have been the reference to supporting character Detective Miller as an ancestor of Lucie, and that change would only involve a single line. Secondly, and more conspicuous to me, is that this story feels very incomplete. One gets the impression that this is a fragment of a much longer story—the resolution, perhaps, but still only a fragment. The story centers around a carnival barker who has somehow acquired the TARDIS and is using it in his show—but how did he acquire it? How did he manage to separate the Doctor from it? What’s wrong with the TARDIS, that it sends people to the future and locks them out—and how does it do that without ever leaving its spot at the carnival? There’s so much that could be told here, and even begs to be told, but isn’t. It’s not a terrible story, and it’s performed and executed as well as possible under the circumstances; it simply feels incomplete. It’s also the shortest entry in this collection, at about twelve and a half minutes. We do get a single continuity reference here; Lucie mentions Gallifrey in passing, leading the barker, Smith, to speculate that Gallifrey is in Ireland (a gag that appears numerous times; the TARDIS wiki cites at least four occurrences, as far back as The Hand of Fear). Next time: Back to the beginning! Sort of, anyway. We’ll wrap up Short Trips, Volume 3 with the First Doctor’s scattered contribution, Seven to One. See you there!